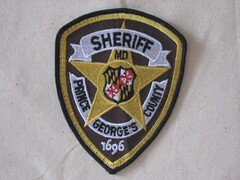 A local paper is reporting this morning that a Prince George’s Sheriff’s Deputy was released without charges in a suspected DUI incident. The officer’s personal vehicle was found in a ditch, and the deputy failed field sobriety tests, but he was let go without any charges in early March. A sergeant with the Sheriff’s Office ordered the release, and is now serving a suspension for the decision. The creepy part of the story? The person who brought this decision to light? Sgt. Rafael Hylton, the brother of the current PG County Police Chief Roberto Hylton. Guess who’s running for Sheriff? Sgt. Rafael Hylton. Sgt. Hylton is currently claiming that he’s suffering from a hostile work environment for failing to support his boss’ candidacy for County Executive in PG County. Don’t you feel safer already?